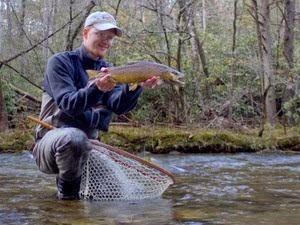 Winter is a somewhat lean time for trout in the Smokies. There are still plenty of nymphs in the water but they definitely aren’t as active or readily available to the trout. Hatches are sparse if present and consist of midges and perhaps a few BWOs or stoneflies. On the other hand, spring always brings quality hatches. Even when there is not an active hatch in progress, the trout feed heavily on the bounty of aquatic insects and other food sources in the drift. 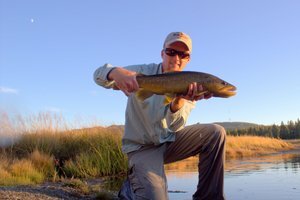 The quantity of food available means that even the usually wary brown trout are sitting out in the open consuming as many calories as possible. 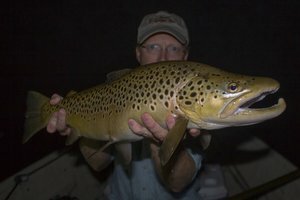 I catch more browns in the spring than any other time of the year except possibly early fall just before the spawn begins. Best of all, they tend to run a little larger than the average Smoky Mountain trout. Camping is best in spring or fall, and I make sure to take at least a couple of camping trips during those times each year. A little over a week ago I found myself in the Smokies for my first spring camping trip hoping to run into a good hatch. All winter I have been looking forward to the return of steady dry fly action. While bugs were hatching, including Quill Gordons, Blue Quills, Brown Stoneflies, and Little Black Caddis, the heavy hatches I was hoping for didn’t happen. In fact, the best hatches I encountered were of the little brown stoneflies. Trout don’t normally rise very well to these insects although a stonefly nymph imitation can be deadly. Over the course of the weekend, I had very good success with a Tellico nymph which is a great generic stonefly nymph imitation. Wooly Buggers and Pheasant Tail nymphs rounded out the rest of my arsenal. For dries, all I threw was Parachute Adams to match the Quill Gordons I found sporadically hatching. The fish responded best to the nymphs but under the right circumstances trout would rise to a well-presented fly. The larger browns were either in deep runs or waiting in ambush near structure, particularly overhanging or undercut rocks. On Sunday I hiked a good distance up Little River with my buddy Kevin. We were searching for solitude and hungry trout and found both. Three miles of hiking put us above the last angler and gave us lots of good water to choose from including some really nice pools. We started fishing subsurface offerings which I stuck with for most of the day. Kevin switched to a dry after awhile and found plenty of willing trout. The big surprise of the day was a small young of the year brook trout I caught around three miles upstream from the Little River Trailhead at Elkmont. That is unusually low to catch a brook trout but this was probably because it washed down during one of the recent high water events. The tiny fish somehow managed to take the fly, beating several other much larger rainbows which makes one wonder about the theory of rainbows out-competing with the brookies. 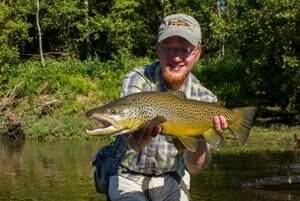 My best trout of the day was a nice brown of 15-16 inches that nailed the Tellico almost before it hit the water. When I saw the golden sided fish roll, I almost dropped the rod in excitement. Thankfully all the knots held, and I beached the beautiful brown at the low end of the pool. After a couple quick pictures, I released the fish and watched as it shot across the stream to a hiding spot near the far bank. 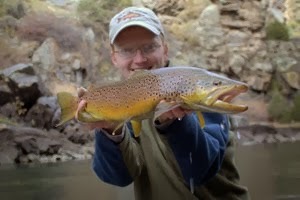 Continuing up the river, I caught several more nice fish including another brown of around 13 inches. Small streams and willing trout provide one of the most enjoyable ways to spend a day fly fishing in my opinion. This day on the water was one of the better small stream experiences I’ve had in the last year. The dogwoods are just about to start blooming in the Smokies. I remembered this picture I took several years ago just above Elkmont of on early blooming tree. You just can't beat spring in the Smokies! As fishermen, we dream of the ultimate fishing experience which is probably different for everyone. Most likely each has a common denominator however. Large numbers of quality fish is the stuff dreams are made of, and the best is when the fish are fighting over the opportunity to inhale your fly. In the Grand Canyon, I was able to have such an experience. Our second full day in the bottom of the canyon found most of us in better shape and ready to venture further afield in search of the hidden wonders of our surroundings. Myself and three others decided to make the hike up to Ribbon Falls. I wanted to enjoy using my camera and of course wanted to explore Bright Angel Creek further in search of the beautiful trout that inhabit its waters. After a hearty breakfast, four of us began the hike up the canyon towards the falls. As we hiked, I forced myself to keep moving past all the beautiful water. Our goal was to reach the falls before the sun moved behind the canyon wall. Ribbon Falls is beautiful regardless of your perspective, but I wanted pictures with the sun on the water. This meant that I had to skip every spot where I saw nice trout hanging suspended in the clear water of Bright Angel Creek. The fast hike was worth it in the end as was denying myself the time to stop and fish. I would still have the whole afternoon ahead to fish my way back down the creek. Ribbon Falls was beautiful with the sun creating a rainbow in the spray of the falls. Just 45 minutes after arriving at the falls, the sun moved behind the canyon walls and the now shaded falls did not have the warm ambiance it had upon arrival. I climbed up behind the falls to enjoy the view through the spray, taking pictures at every step along the way. After enjoying the scene, I moved a short distance back down the canyon to cook up some lunch. The delicious spinach ziti gave me the energy to hike back to camp and do some fishing along the way. Strolling back down the canyon, I started seeing spots I had promised myself I would fish on the way back down. A large rock by the trail provided the perfect spot to sit down and change into sandals to wade the cold waters of the creek. Rigging up my rod with a wooly bugger and pheasant tail, I moved down the steep slope to a deep run that just looked fishy. As I moved slowly along the edge of the stream, I started seeing trout holding everywhere in the calmer water near current seams. The crystal clear stream made finding trout the easy part of the equation. I still had to make the cast and correctly present the fly though. My first cast was a little sloppy and not very accurate, it splashed just behind the trout I was targeting. To my surprise, the fish turned and chased the flies downstream, turning as it took the pheasant tail. I set the hook and was soon admiring a beautiful resident rainbow. Moving another step up, I repeated the process and caught another trout. Thinking to myself that I might be experiencing the easiest catching I would ever enjoy, my next cast was made to the deepest part of the pool. In awe, my eyes beheld dark shadows racing from every direction as the rainbows were nearly fighting for the opportunity to inhale my offerings. Small stream trout are absolutely a blast. Bright Angel Creek is now high on my list of best small trout streams. The overall quality of the experience makes a trip well worth the effort required. The trout did not seem particularly spooky, probably because the flows were a little high due to the recent winter storm. Fish that "spooked" would still often take a fly. Finally, after catching more than my share of fish, I headed back down the trail. Just before Phantom Ranch, I made the turn onto the Clear Creek trail. A short distance up, I settled down at an overlook of the river to watch the sunset. Nothing could make the experience better except to have a few more nights scheduled at the bottom of the Grand Canyon. Someday I will go back, but until then I have great memories of the best backpacking trip yet! Periods of high water may be the norm this spring and early summer. So far, the tailwaters have all been pushing a lot of water and that doesn't seem likely to change any time soon. Streams in the Smokies have all seen flows spike up, and they have been slow to fall out indicating that the ground is well saturated. This past Sunday, I passed up the opportunity to drive to the Smokies for the day, mostly because the flows were up and had been for a few days. Generally I have not experience good fishing in similar conditions. I'm sure I could have found fish, just not sure how many and if it would be worth it. Our first full day in the bottom of the canyon was a day to relax and recover. Everyone had varying degrees of soreness in their knees so a slow day sounded good to most everyone. Three people opted to take a long day hike up to Ribbon Falls which was close to 14 miles round trip from the Bright Angel Campground. The rest of us lounged around camp, took short walks up or down the creek to some fairly close overlooks, and to the river. One particularly nice walk took us a half mile or so up the Clear Creek Trail to fantastic overlooks of the Colorado River as well as its tributary we were staying on, Bright Angel Creek. An early morning walk to the Black Bridge provided some nice scenery for my camera as the sun peeked around canyon walls and lit up the now chocolate milk colored river. The tunnel on the south side of the river gave me some interesting ideas for pictures and made me wish I had brought some type of tripod with me. After breakfast, we walked up towards Phantom Ranch and beyond, eventually making it up the Clear Creek Trail for the views before descending back to camp for lunch. In the afternoon, we hung out near the river, soaking up the sun, and of course I did a little fishing. My first opportunity to catch a fish came as we headed up towards Phantom Ranch. In camp, prior to the hike, I tied on a wooly bugger with a BHPT as dropper. The water was cold, and I wasn't going to bother with dries unless I found rising trout. Despite the lack of rising fish, I found plenty of insects. Clouds of mayfly spinners could be found above the trail in the middle to late parts of the day. Midges and a few caddis and stoneflies were seen from time to time along the stream. There was obviously lots of food available to the trout which explained why all the fish I caught during the trip were very healthy for such a small stream. As we headed up the trail towards Phantom Ranch, I saw the upper bridge into Bright Angel Campground and went over to take a look at the creek. On the hike down, I lost my polarized sunglasses, but the water was so clear that I didn't have any trouble spotting fish. As I stared at a nice run just above the bridge, a fish soon materialized below. I quickly moved down below the bridge, and, having carefully noticed exactly where the fish was, picked it out again once I was at the level of the stream. Stripping out enough line to make the cast, I made one backcast and dropped the flies just upstream of the feeding rainbow. The trout chased the bugger downstream, turning as it took the fly. Immediately I lifted the rod tip and the fight was on. Some friends came over to see my first Grand Canyon trout, and were kind enough to also take pictures for me. I moved up to fish 2 other runs above the bridge before rejoining my friends. More fish came to hand, all exhibiting the pale, silvery color that the Colorado River run-up fish all sported. The fish were all strong, accustomed to living their life in the heavy flow of the big river. About this time, my lens cap went in the drink marking the second time I've lost one in the act of documenting a catch. I didn't have much time to feel sorry for myself though because my friends had all wandered well up the trail towards the Clear Creek Trail. I followed along, stopping just long enough to photograph an agave that clung precariously to the canyon wall. On the way up the Clear Creek trail, I received a few funny looks and comments from hikers coming down from the heights above. "Long ways until a place to fish," one person said. I just grinned, not mentioning the nice fish I had just caught or the dark pool I was able to spot on Bright Angel from my now high vantage point. We all soaked in the sun and the views, drinking in the beauty of the canyon, wishing we could stay forever but knowing we had to absorb as many memories as possible since that wasn't realistic. My eyes were recording the scene in my mind while my camera was doing the same. Between the two, I might be able to remember the trip fairly well. Back down along the creek, I caught a few more fish before heading back to camp for lunch. After satisfying my hunger, it was down to the confluence of Bright Angel with the Colorado River. Along the way, I picked up a couple of small rainbows. After hanging out with friends along the river, I headed back up the creek and found my first honey hole. Up until this point, I only caught 1-2 fish per pool or pocket. The sweet spot yielded 5 fish ranging from a small streamborn fish to 14 inch run-up fish. This was just a foretaste of things to come. By this time, it was getting towards evening and time to call it a day. I talked to a couple of fisherman from New York state about fishing their home waters as well as streams we knew in common in the Yellowstone vicinity. After we had talked for awhile, my three friends that had walked to Ribbon Falls came trekking by, reminding me that it was about time to head back to camp and join everyone for supper.